Wintry day pick me up! 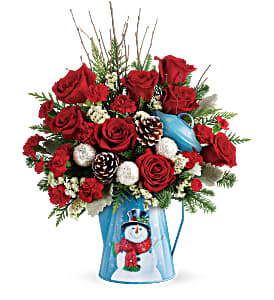 Pour on the charm with this radiant red bouquet, beautifully arranged in a vintage-inspired metal kettle with smiling snowman design. 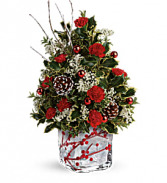 Deck the halls with this elegant Christmas tree-inspired arrangement, festively presented in a hand-blown, frosted glass cube with winter berries and a dusting of sparkling glitter. A bountiful gift basket that will please the health-nut and chocoholic alike! 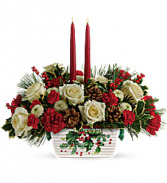 A delicious assortment of gourmet chocolates and fresh fruit are presented in a handled basket. It's a mouth-watering choice for a corporate gift, get well gift or thank-you gift!